Comments Off on Do Catholics Worship Saints? “No,” I replied, “because necromancy is an attempt to manipulate the spirit world in order to find out about the future.” Praying to a saint, I explained, isn’t a manipulation of the dead, nor is it aimed at foretelling the future, but rather it is about having a real relationship with our brothers and sisters in Christ who are now in the presence of God. “Then why even bother to pray to saints?” he asked. “Why not just pray to God directly?” “If I were to ask you to pray for me,” I said, “would you do it?” “Yes, I would,” he admitted. As a former evangelical myself, I know how committed many Protestants are to praying for one another. After all, the apostle James exhorted his readers to “pray for one another, that you may be healed. The fervent prayer of a righteous person is very powerful” (Jas 5:16). Put another way, the saints in heaven are just as real and immediate to us as those sitting beside us at Mass. In fact, they are even closer, as they are able to relate to us perfectly, being holy and complete, freed from sin and the distractions of this world. They are alive — truly alive, filled with divine life and enjoying perfect union with God. They are, in the words of the Letter to the Hebrews, “a cloud of witnesses” (12:1) surrounding us, helping us and encouraging us. Many Protestants reject outward (and even inward) expressions of devotion to saints because they fear it smacks of idolatry. But the Church has always been very mindful of this concern. For example, the Second Council of Nicaea, in 787, carefully distinguished between “respectful veneration” shown to saints and “true adoration” which, “according to our faith, is due to God alone.” It also noted that veneration shown to an image (or statue) is veneration given to “the person represented by it.” The author of Hebrews wrote of running the race — that is, living the Christian life — by looking to “Jesus, the leader and perfecter of faith” (12:2). 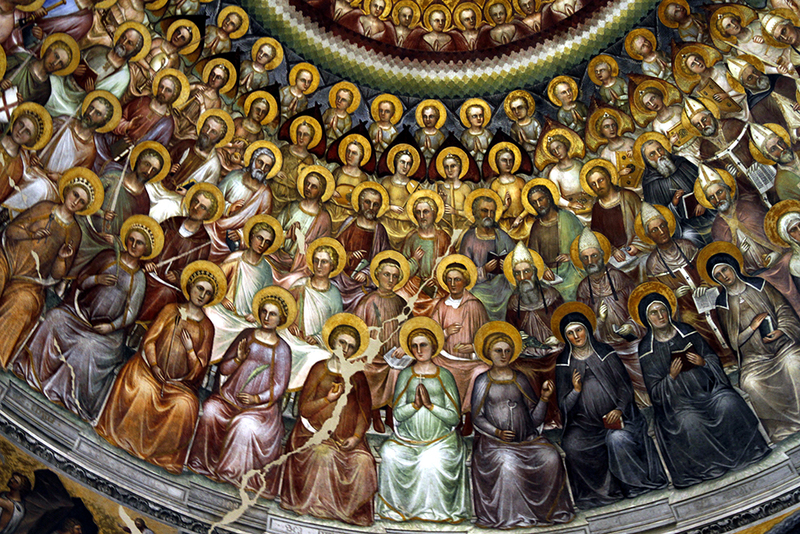 Likewise, the Second Vatican Council noted that by “celebrating the passage of these saints from earth to heaven the Church proclaims the paschal mystery” and “proposes them to the faithful as examples drawing all to the Father through Christ” (Sacrosanctum Concilium, No. 104). United in Christ, we are siblings by grace, the life of God (see Catechism of the Catholic Church, Nos. 1997-98). Yes, worship is due to God alone. But admiring, respecting and loving those who are true disciples of Christ is not worship. Rather, it is befitting among brothers and sisters, which we are in Jesus, by the power of the Holy Spirit, according to the will of the Father.